Sawayama Castle (佐和山城) is located on Sawayama mountain, one of 150 meter height from hillside spreads north and south ward at the east of central Hikone city. Sawayama mountain consist of one prominent peak and connecting two ridges spreads both side at the same height, it has a powerful view like a bird spreads wings. In addition to its exterior, Sawayama mountain locates at vital point to control the traffic. Current Hikone and Maibara area is a narrow path between Lake Biwako and mountains, and also a crossing point of roads from westward which is connected to Kyoto city along lake Biwako, from southward passes Koka area, to northward toward Hokuriku region and to eastward toward Chubu region and Kanto region. Even today important railways and highways crosses Sawayama mountain, and Maibara station which stands near Sawayama mountain is an important diverging point of railroads and roads. Because of above conditions, Sawayama castle had played an important role in medieval era. Sawayama castle was originally built by Sasaki clan, a local lord followed Yoritomo Minamoto (1147-1199), the founder of Kamakura shogunate and later became Rokkaku clan, a governor of south half of Omi province (Shiga prefecture). Rokkaku clan kept Sawayama castle by former half of 16th century, but at the middle of the century, Azai clan, a warlord of north half of Omi province and lord of Odani castle (Shiga prefecture), seized this area from Rokkaku clan and used Sawayama castle as a fortress against Rokkaku clan along with Kamaha castle (Shiga prefecture) at neighbor place. During Azai period, the commander of Sawayama castle was Kazumasa Isono (?-? ), a brave general of Azai clan. When Azai clan became hostile with Nobunaga Oda (1534-1582), ruler of central area at that time, Sawayama castle became an vital point of both clan. Oda clan had to connect its main territory such as Owari province (Aichi prefecture) and Mino provine (Gifu prefecture) and its political capital Kyoto city, and anti Nobunaga alliance including Rokkaku clan and Azai clan tried to shut up this line. In 1570, after the victory of the battle of Anegawa against an ally of Azai clan and Asakura clan, Nobunaga encircled Sawayama castle by large army. Kazumara stood this siege over half year, but due to a wild rumor saying betrayal of Kazumasa spread by Oda clan, Azai clan became to doubt for Kazumasa and did not send supply to Sawayama castle. Owing to lack of supply, next year Kazumasa finally opened the castle to Nobunaga and surrendered. Instead of Kazumasa, Nobunaga appointed his trusted retainer Nagahide Niwa (1535-1585) as a commander, and repeatedly stayed this castle before the completion of his main base Azuchi castle in 1579. When Nagahide moved to Nochiseyama castle at Wakasa province (western part of Fukui prefecture), Sawayama castle might be managed directly by Oda government. After the death of Nobunaga at the incident of Honnoji in 1582, his regional commander Hideyoshi Toyotomi (1537-1598) won the battle for successor and became the next ruler. Toyotomi government relied on the authority of Emperor in Kyoto and economic power of Osaka, thus Kinki region was a vital part for the government. Sawayama castle was a strategic point to guard Kinki region toward east, especially for Ieyasu Tokugawa (1543-1616) who was the largest lord under Toyotomi government and potential enemy. At first Hideyoshi placed his entrusted generals such as Hidemasa Hori (1553-1590) or Yoshiharu Horio (1544-1611), but in 1590 Hideyoshi appointed Mitsunari Ishida (1560-1600), his chief administrative staff, as a commander of this castle. Mitsunari was born as a son of local lord near the castle, and he was found by Hideyoshi for his quick witness, when he served teas for Hideyoshi who dropped at the temple Mitsunari trained. Mitsunari had good talent of calculation and administration, and contributed to military actions of Hideyoshi by supporting logistics. After the unification of Japan by Hideyoshi, Mitsunari served local magistrate of important cities such as Hakata or Sakai, and promoted to the first position of five magistrates of Toyotomi government. Under the support from Hideyoshi, Mitsunari reformed Sawayama castle into a modern one. Sawayama castle roughly consist of central area at its peak, surrounding areas spreads to connecting ridges, and eastward hillside areas. Central area is a rectangular shaped flat area of 100 meter long and 40 meter width, and there might be a five story main tower over basement at its southern edge. There might be entrances at north, east and south of this area, but structures of central area is totally destructed and there only remains small undulation. Formerly this area is wholly wrapped by stone walls, and this stone wall is also totally demolished but two large stones at the southeastern corner of main tower basement still remains at the middle of slope. Over the ridges spreads from central area, many areas such as Enshoyagura area and Mizunote area at northward, secondary and third area at northeast ward, Taikomaru area at southeast ward and Hokkemaru area at southward are built. Although these areas are narrow, each ridge has a defense fort at their edge ,and many bottlenecks and walls are built to guard the attack of enemy. These areas are connected by roads from central area, but because of the collapse of slope, a path to northeast ward areas such as secondary area and third area is cut off. At the eastern hillside of mountain surrounded by two ridges, there was a hillside are where residence of lords and retainers exist. This hillside area is protected by linear clay walls and water moats, which bends like S letter. At the western hillside there was also residences of high class retainer, and castle port faced Lake Biwako. Total size of the castle is about 800 meter long and 600 meter wide, and because of its size magnificent look, people said that “There were two things undeserved to Mitsunari. Sakon Shima (?-?, highest vassal of Mitsunari) and Sawayama castle". After the death of Hideyoshi, as expected, Ieyasu Tokugawa started his action aiming at next hegemony. Facing this situation, as a chief administrative staff of Toyotomi government, Mitsunari raised army with other large lords such as Mouri clan or Ukita clan against Ieyasu. But among the conflict between front generals and administrative staffs in Toyotomi government, many generals of Toyotomi clan supported Ieyasu. Yoshitsugu Otani (1559-1600), the commander of Tsuruga castle and his lifetime fellow, persuaded Mitsunari to stop his action as Mitsunari was unpopular among generals and did not have skill to command large army, but Mitsunari's will was quite firm. At last Mitsunari started his action and Yoshitsugu decided to follow Mitsunari by the end. Finally there arose a decisive battle at Sekigaraha (Gifu prefecture), but due to a betrayal or standing by and watching of large lords such as Mouri clan or Kobayakawa clan, Mitsunari was defeated by Ieyasu. Mitsunari left the battlefield and tried to return to Sawayama castle, but was captured several days later, and executed at Kyoto city. Just after the defeat of the battle, Sawayama castle was also assaulted by winning Tokugawa side army. As Sawayama castle was guarded by only small number of stayed soldiers, after the fight of few days Sawayama castle fell and remaining relatives of Mitsunari shared their fate with the castle. After the battle of Sekigahara, Naomasa Ii (1561-1602) was appointed as a governor of this area. 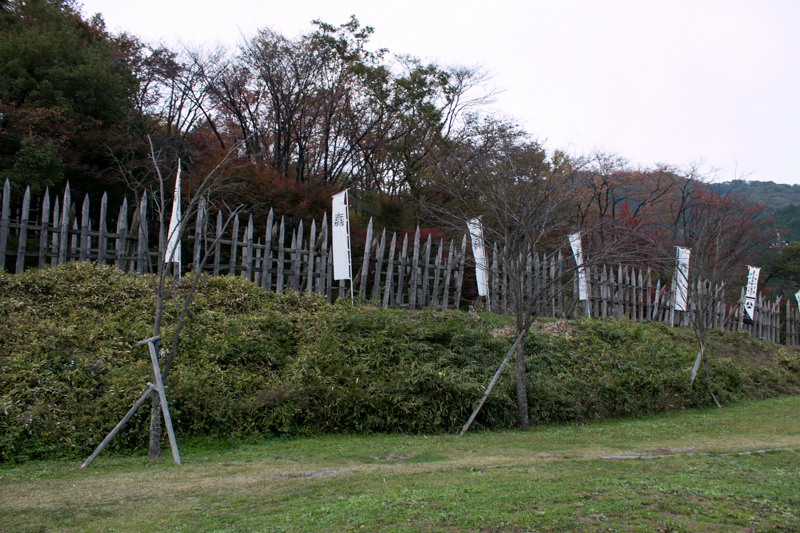 At first Naomasa used Sawayama castle, but even through it was reformed, Sawayama castle was an old style castle with narrow areas, and it was difficult to make a defense line and also an effective counterattack as it was divided into hilltop and hillside area. 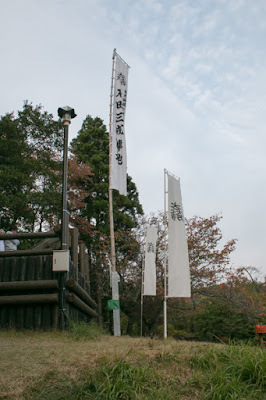 In addition to this, Sawayama castle was a castle of Mitsunari Ishida, the leader of enemy at Sekigahara and chief administrative staff of former government, thus Naomasa decided to abolish Sawayama castle and build Hikone castle. To erase the memory of Mitsunari, Sawayama castle was totally destructed and basement of main tower was shaped to flat. Buildings were dismantled, and materials and stones were used for construction of Hikone castle. Due to above reasons there is almost no structure of the castle remains on the hill, except for main gate moved to Soanji temple near Hikone castle. But rough shape of terrace still exist and we can grasp outline of former castle. 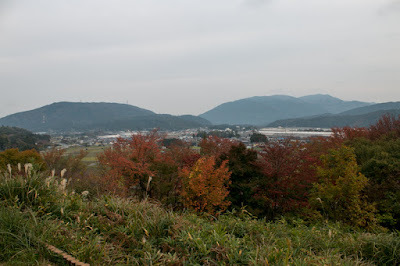 External barriers and water moat still remain in front of the castle at the south of mountain, and the magnificent shape of Sawayama mountain still remind us authority of chief administrative staff of Hideyoshi. 20 minutes walk from JR West Tokaido Honsen line Hikone station to climbing entrance inside the ground of Ryotanji temple. Another 30 minutes walk from climbing entrance to central area. 15 minutes drive from Meishin Expressway Hikone interchange.